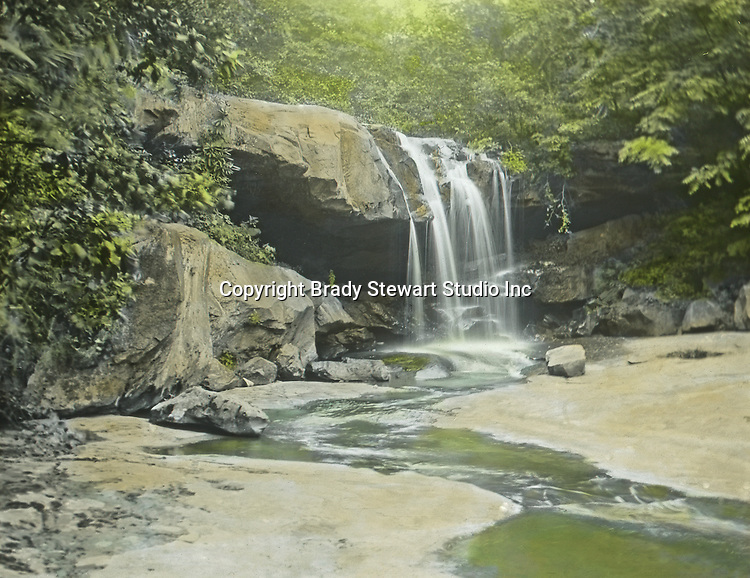 Fayette County PA: Waterfall on one of Bear Run's streams - 1905. The Stewart family often took weekend trips to Fayette County's Bear Run. Bear Run is a nature reserve today and is near Frank Lloyd Wright's Fallingwater. The Stewart's visited Alice Brady Stewart's sister and brother who lived in Stewart Township PA. To give family and friends a better feel for the adventure, he hand-color black and white negatives into full-color 3x4 lantern slides. The Process: He contacted a negative with another negative to create a positive slide. He then selected a fine brush and colors and meticulously created full color slides. Keep in mind, this black and white image was taken in 1905.